Alex Hall and Emil Amos know how to keep themselves busy. They’re the creative force behind the sweeping, cinematic rock of Grails, while Amos also finds time to play drums with rock-druids Om. Lilacs & Champagne have already released two full albums and come to us here with a brand spanking new EP of cinema-obsessed psychedelia. The duo have expanded to a four-piece for this release with Zac Reno and Ash Black Bufflo (that can’t be his real name) joining the fun. While the band certainly shares some common ground with Grails (the cinema references, the astounding musicianship), they’ve also carved out their own unique take on things. Where Grails lean more towards rock, Lilacs & Champagne employ the use of beats, cut-n-paste soundbites and distinctly funky rhythms. Opening piece ‘Shower Scene’, with its skipping record effect and sleazy lounge vibes, recalls the likes of DJ Shadow more than it does Ennio Morricone (a key influence within Grails music). The track-lengths are also noticeably shorter than the epics which made up Grails last LP, Deep Politics. Next up we get the late-night funk of ‘Le Grand (Brooklyn Bridge Version)’ with its stabs of organ and air-guitar-worthy soloing from Amos. Midnight Features Volume 1: Shower Scene is clearly indebted to the influence of obscure 70s horror soundtracks (for this reason it brings recent cinematic tribute Berberian Sound Studio to mind). It's the kind of record you’d find hidden deep in the vaults of your local record store or in the house of a particularly enthusiastic collector. You can also picture the fast cars and loose morals of some great lost 70s cop show while absorbing the EPs montage-worthy funk. ‘The Door’ reinforces the group's hip-hop influences and again brings prime-time DJ Shadow to mind, while ‘Sensations (Corpse on the Beach Version)’ rocks like a mutha with heady drum-rolls and urgently soaring guitars. ‘Maple St.’ is both creepy-as-hell and untouchably cool, while closing track ‘Cinemaxx’ is just one hell-of-a-groove. While Shower Scene is certainly an accomplished and enjoyable listen, it never quite reaches the mind-blowing heights of Grails' latest work. However, as another string to Hall and Amos’ ridiculously talented bow, it achieves more than others could hope for (and besides, maybe a direct comparison between the two projects is a little unfair, if understandable). 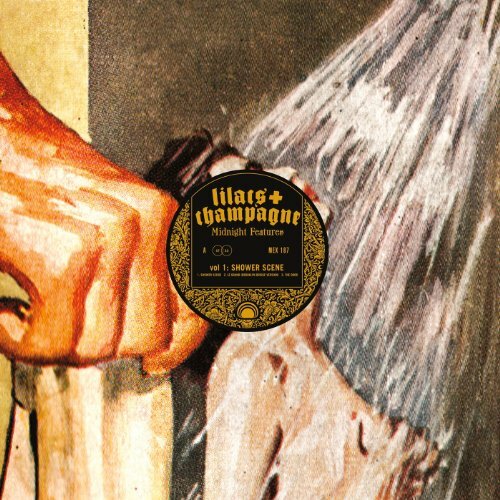 With this latest release, Lilacs & Champagne have created a really entertaining curio for anyone with a passion for late-night beats, rock solos and cult cinema soundtracks.